Isaiah has been killing it so far in 2018. He broke the State Record in Javelin a few weeks ago with a throw of 194-0. 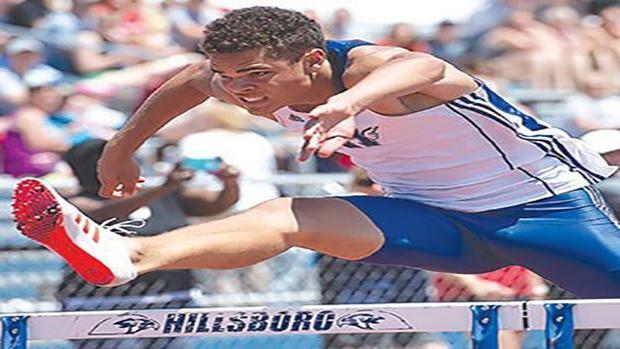 He's also ranked 3rd in Class 4 in the 100H, 6th in the 300H, and 9th in Long Jump. We had a Q&A with him last week, and you should check that out if you missed it. Max enters the State Series with the 2nd fastest time in the Class 4 3200 at 9:25.08. To go along with that he also has the 4th best 1600 time with a 4:23.81. Look for him to kick it up a notch in the next few weeks as well. Halle enters the week with the number 1 ranking in the Class 4 Girls Javelin. Her throw of 143-2 is nearly 10 feet farther than 2nd place, so she's in a really good spot heading into the State Series. Peyton enters the week with 2nd best High Jump in Class 4. She's one only two girls to have cleared 5-4 this year, so she has the potential to battle for a State Championship in a few weeks.